I am going against my blogging rule. I’m writing about something I detest writing about: blogging. I hope I do not give the impression of being a gloating cur. On the four year and two month anniversary of Lame Adventures’ debut, I was the recipient of WordPressian validation. 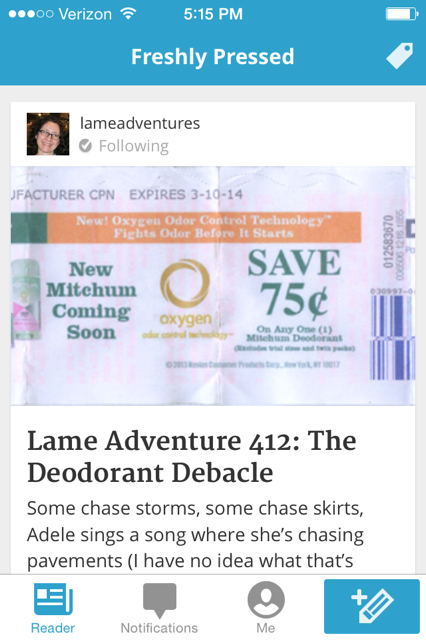 I was notified that last week’s post, Lame Adventure 412:The Deodorant Debacle, was selected to be Freshly Pressed. My stats had a nice spike. What seemed like a million percent increase to me. I thank all that took the time to visit. I welcome the increase in my following. To my 125 new followers, I will make an effort to visit your sites. Please accept my apology in advance that I anticipate this mission could take me two hours shy of forever to complete. I lead a very active life: I work full-time, I write humor pieces that do not appear on Lame Adventures (in 2013, I self-published a book; my worst seller), I work out four-five times a week, I usher off-Broadway theater and I make time for my posse. Please be patient with me. If you are inclined to post several times a week, several times a day, or your posts are long-form, I am easily overwhelmed. Until a day is 36 hours in length, I have neither the time nor the energy to read a barrage of posts from one blogger or the blogospheric equivalent of Ulysses. To me, less is enough. If you receive a like from me, I guarantee that I read your post and genuinely liked it. I was Freshly Pressed once before. It happened 196 Lame Adventures ago, on a Friday in August 2011, the era before Freshly Pressed badges began adorning sites. I had about 70 likes, 99 comments and a monumental hangover from quaffing my weight in sake the night before. When it happened again last Monday I was stone cold sober. That morning, I groused to Godsend, my colleague at The Grind, that traffic was slow. Me: It’s obvious to me that this post is a leaden soufflé. I concluded that my post, the possibly 1,788,883rd Freshly Pressed, fell nicely in-between the average head of human hair and all the grains of sand in the world. Krista answered my email. She explained that 1,788,883 is a numerical ID code. There have been less than 12,000 posts that have been Freshly Pressed. 1 in not quite 12,000. I intended to write that deodorant post a week earlier, but that week had been hectic. I prefer to publish posts whole-assed rather than half-assed so I held off writing it. Delaying writing that post was one of the smartest moves of my life ranking with when I left my desk at another Grind a nanosecond before the ceiling collapsed directly over my chair. Gore Vidal: Every time a friend succeeds, I die a little. I knew that feeling through my first 215 Lame Adventures. I returned to feeling like chopped liver through the next 195. You can never predict when your lucky number will come up, but hopefully it will be well before 1,788,883. Regularly scheduled Lame Adventures will return next week. Look, the Mona Lisa’s in Manhattan! This entry was posted in Humor, new york city and tagged blogging, crap shoot, freshly pressed, gratitude, luck of the draw, miracle. Bookmark the permalink. Thanks Melanie and thanks for the support. I completely agree with you about the apologies between posts — as if anyone notices. I notice when Pulitzer Prize winning New York Times columnist, Maureen Dowd, is on vacation. That’s about it. My buddy bloggers like Frank are good at keeping their readership informed. As you know, he incorporates what’s going on into his site. That works well for me, too. Way to go! I enjoyed your deoderant post a lot before it got put on the billboard. I have good taste. But, this isn’t about me, is it? Writing is an affliction that some carry the rest of their lives once it matures. Not many people carry the gene in its entirety. Lots of people have symptoms they think indicate they are a writer. Few are true carriers. I put you in the category of being infected. Keep it up. I always am glad to see your post whenever it happens. That’s a very kind way of describing it, Jim. You’ve pretty much nailed me. I was quaffing suds with Coco the other night and got into a story I’m currently writing (not for LA). She’s been my sounding board for years so she’s used to it. She had a spot on suggestion. Thanks for the loyalty! As a fellow long-time blogger, I know we both appreciation the recognition, stats spike, new followers (although most never reappear), and the small boost it delivers for our ego … but it’s time for me to return to the boxes. It’s very true about most new followers not reappearing. I checked out those I encountered last FP go round. Most vanished into the ether, but those that did stick around are longtime regulars. Some I’ve even met and as you know, I served as a witness at Kathy’s (Hugs from Ecuador) wedding ceremony last year. That was very cool. Hey, keep the Aleve and Bengay handy for a while. You might need it! The Freshly Pressed honor truly is a high, isn’t it? And richly deserved, V. You’re a great writer and I love your humor. And the Gore Vidal quote made me laugh out loud! Are you going to see the Mona Lisa? It is a nice high indeed, Cathy! Thanks for the support. Gore had a very clever way with words, but I bet he would have been intimidating as hell in person. 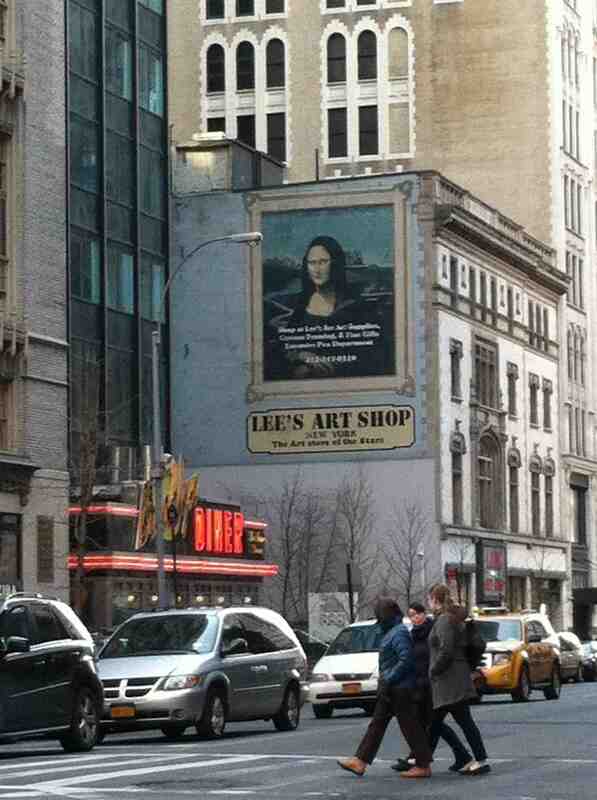 I can see that Mona Lisa whenever I’m on 57th Street — it’s an ad for Lee’s Art Supplies! Here’s some celebrity gossip: Angelina and Brad have shopped there. Maybe I should rename my site TMZ now. I like your new gravatar! You so deserve it, V! Congrats again, my friend! Thank God you won’t try to read everything those 125 new followers write. It might kill you. And for those folks who post every day and the too-many who post multiple times a day, I have to ask—–where do you find the time??????? Before I had any following I wrote three times a week. Then, I started getting a following — and a life. Milton begged me to publish less. He, my best friend, was completely overwhelmed. In the beginning, it was like a new toy, but once the novelty wore off and I figured out my voice, that was when I realized that pursuing quality over quantity was a better way to go. Plus, Milton could give his eyeballs a rest. Thanks for the years of support. Like you, I work full time and have a life outside the blogisphere. 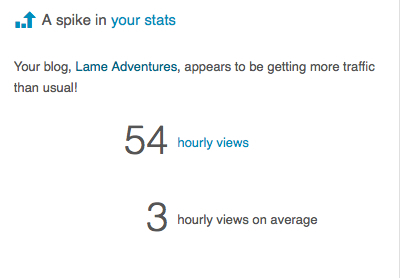 I don’t even have time to reply or repay blog visits for everyone who leaves a comment on mine. There’s a certain amount of guilt that goes along with that, but I find that spiced rum or a strong lager helps me get through it with a minimal amount of pain. Congrats on being freshly-pressed. I suppose that took all the wrinkles out and you now have creases as sharp as your wit. I think you’re a great writer and I enjoy your humor. Keep up the good work. This means a lot from you, Russell. I am well aware of how inundated you right now are as you prepare to launch your humor tome. I was in a similar place to where you are now a year ago. It’s challenging, especially when you work full-time and you’re trying to keep your blog going. I think you’re an excellent writer and I value our friendship. It’s always good to have a southern man on my side, should this city slicker ever visit Arkansas. well deserved because you rock me like a hurricane! Awwwwwwwwwwwwwww, thanks Jules! You’ve been along for this ride for the long haul, pal! CONGRATULATIONS!!!! That is no easy feat. I received a few back in 2011 and 12 when 375,000 posts were blogged per day and half were pictures of cats. Now there are over one million posts blogged per day so you just became the equivalent of being struck by lightning. I missed that post! Off to read…. HAHAHAHAHAHAHAHA “half were pictures of cats”!!!!!!!!!!! That’s great, Susie! And uh … I didn’t realize that. I feel pretty good for having been metaphorically struck by lightning. It must be all the spin bike riding and now eating predominantly organic. I don’t know nothin bout no stats but V, your ode to deodorant was indeed a masterpiece. Quite befitting to a humorous wordsmith of your caliber. Like how I did two different dialects there? I can do accents too. Yes, Brig, you managed to segue from Gone with the Wind to Downton Abbey! Impressive and inspired. I had no idea that my getting FP’ed would have such an affect on you. I am honored that you would demonstrate this talent on my site. Thanks! Ditto — and welcome to the club, pal! Congrats to you! I am not feeling Gore Vidalish at all about it although that quote is amazing. Thanks and I’m so glad that you appreciate Gore’s quote! Back in the day when I was knee-high to tooth plaque, my mom turned me onto him. She probably sensed that she had a neurotic writer in her midst and was preparing me for future angst. It’s so good to hear from you! I was fearing the worse: that you had crossed over to The Other Side and had become a reality TV show contestant. Congratulations! Duane Reade comes through AGAIN! Awwwwwwwwwwww, thanks Jen! And thanks for reading my worst seller. You are a bud! Congratulations, LA! I’m one of those outside of the 12,000 but I’m beginning to feel I’m part of the minority now… however, well done you! I knew you’d be Freshly Pressed sooner or later. Thanks Tom and keep hope alive. You just cannot predict when you’re going to hit your lucky number. Susie Lindau has compared it to being struck by lightning — pretty much how I felt because I did not think I would ever be FP’ed again in the modern era. Enjoy all the fame and fortune you will reap.It was a great post. Thanks Jackie and I do enjoy “my” Milton — the award with attitude! I am hoping that he and I will be sharing another LA soon. Congrats! I can only imagine how it feels to be freshly pressed… but you deserve recognition for your very entertaining writing. Reading your blog is a light note in my day. Enjoy the glory! Thanks Terri! I hope that one day you’ll also have a moment in the WP spotlight. I love your site, too. Kush the Wonderful makes me regret being allergic to cats. Congratulations, getting freshly pressed is quite an honor. You deserve it, your blog is quite entertaining. You should have said “I would like to thank all the little people who made this possible BUT I WON’T as it was ME ME Me alone who achieved this greatness!!!!!!! Congrats to you my friend! Every so often, I do get help from a guy in Fort Lee named Martini Max. Thanks! Thanks Arti and thanks for being really real! In my fantasy future WordPress update, bloggers would be allowed to manage their followers. Then, my recent onslaught would be reduced from 125 to 12, after I unload all the spambots. You were freshly pressed again, that is awesome congrats! I loved that one, it was so worth it. Thanks for the kind words and for following me all this time Val. Yay! A more deserving blogger does not exist. You da bomb! The attention was nice, Guat, but as for the book sales, it would not behoove me to quit my day job anytime soon or ever. Thanks for the support, buddy!